With more than 200 miles of hiking, biking and riding trails, Redding could claim title to being California's trail capital. 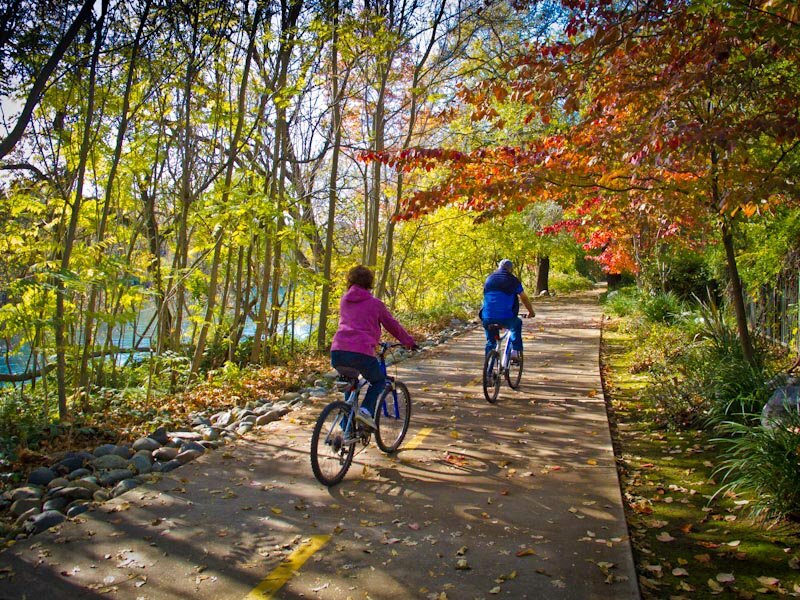 Redding Area Trails can be downloaded free, or pick up a printed copy at the California Welcome Center in Anderson. Locations of 14 major points of interest seen from the trails are noted on the guide’s color-coded trail map, including descriptions of where architecturally significant bridges, historic sites, scenic viewpoints and wildlife can be seen. Taste 9402 Main St., downtown, (209) 245-3463; www.restauranttaste.com. L on Sat, D daily; $$-$$$. Reservations advised. Well reviewed and operating in a comfortably renovated vintage building, this popular spot features a creative menu and impressive wine list and fills early. Warm wood accents the muted persimmon and deep-mustard walls, and large windows overlooking the quiet street bring in plentiful light. The menu changes regularly, but the unusual “mushroom cigars” (phyllo stuffed with a mix of mushrooms and goat cheese) are a long-time favorite appetizer. Entrees might include a giant braised Angus short rib paired with dramatic red beet risotto (which goes well with a Yorba Zin made with grapes from a vineyard that is just past one server’s home), or perhaps a grilled Tombo tuna with fingerling potatoes and artichoke salad. A selection of three housemade fruit sorbets—sometimes including blackberry-cabernet--makes a light ending. Original Joe’s 601 Union St./Stockton St., North Beach, (415) 775-4877. L-D daily; $$-$$$. Reservations advised. If you’re wondering where everyone went, it might be to dinner at Joe’s in its new digs (it was formerly off Union Square on Taylor St.). It has been open only a month, yet it hustles and bustles--even in early evening. Diners can sit in the expansive cocktail lounge, in a dining room with windows to the park, or in a clubby back room filled with roomy red booths and a view of the exhibition kitchen. Menu favorites include the Joe’s hamburger (made with two patties, mesquite broiled, and served on Boudin sourdough bread), a rich chicken cacciatore, and a delicate lemony filet of sole picatta. The steaks, chops, and fish come with sides of either ravioli, spaghetti, hand-cut fries, or simple veggies. A good starter is a superb fritto misto with deep-fried calamari, lemon rounds, and olives. Service can be slow, so plan to enjoy a couple of the well-priced classic cocktails ($6); I favored the Manhattan with two brandy-drenched cherries. And I was in bliss with the rich, rich butterscotch pudding dessert, topped with caramel sauce and a huge dollop of crème. Amador Vintage Market 9393 Main St., downtown, (209) 245-FOOD. W-Sun 10-6; deli pick-up daily by advance order. This gourmet caterer offers delicious lunch items and desserts. Dine on the spot--either inside at the cozy wine bar or outside on the boardwalk--or take it away for a winery picnic. The curried chicken-salad sandwich and hummus and chips are especially good. Cooking classes are scheduled regularly with Chef Beth. Arka Restaurant, Bar &; Lounge 725 S. Fair Oaks Ave./El Camino Real, (408) 733-2752. L-D daily; $$. Featuring a spacious and colorful dining room, this contemporary spot blends authentic Indian cooking with a stylish presentation. Specialties include tandoori kebabs, biryanis, curries, dosas, and uthappams, plus an extensive selection of vegetarian, vegan, and gluten-free dishes are available. Among the many unusual items are two personal favorites--kaccha kele aur palak pakora (fried fritters of raw plantains and spinach served with a chutney) and chettinad chicken (a spicy tomato curry flavored with black pepper and curry leaves)—as well as tandoori mahi mahi (marinated with lemongrass and kaffir lime and served with roasted Portobello mushroom fritters) and shrimp vindaloo uthappam, (a pancake topped with shrimp in a spicy vindaloo sauce and red onions). Traditional butter chicken (shredded chicken in fenugreek-flavored creamy tomato sauce) is also available. Vegetarian delights include bharwan chandi kofta (paneer and dried cherry-stuffed kofta in a mild cashew-onion sauce accented with kewra and silver vark), bhindi la jwaab (stir-fried okra with onions, pomegranate seeds, and raw mango), tandoori subz kebab (a twist on the traditionally lamb-based dish), and an eggplant dosa (stuffed with smoky eggplant and peppers flavored with tamarind, coconut, and peanuts). The garlic-chili naan is thin and crispy, but next time I plan to try roomali roti, described as “light airy, handkerchief-like.” For dessert, try the classic kulfi rice pudding or the more unusual carrot payasam (stewed carrots with ghee, nuts, and a hint of green chilies); a selection of ports are available at a discounted price with desserts. A daily lunch buffet allows sampling many dishes. Cocktails go well with the cuisine, and an option is to sit at the sleek bar and enjoy appetizers there (happy hour occurs nightly from 3 to 7 p.m. and 9 p.m to closing).